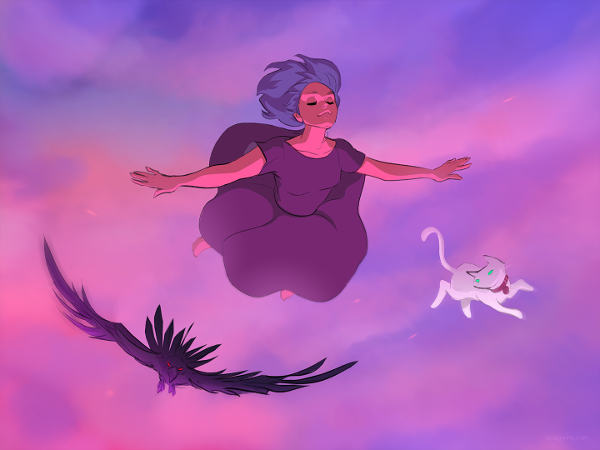 As an adventure game delivered by way of two-sided paintings, Lona: Realm of Colors presents a distinct visual style and keen dualism, using a cat and a crow to guide players through the experience. 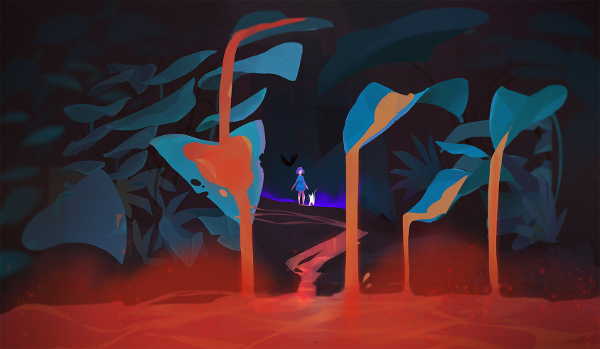 With a Kickstarter campaign in high gear, SpaceFox has a lot on its plate, and I chatted with artist Taraneh Karimi on the novel nature of her project (see also Alter Native). Erik Meyer: Lona: Realm of Colors follows an artist through dual landscapes that tell the story of her struggles and attempts to cope with difficulties. From a game asset point of view, what kinds of challenges have come with level assembly? How much do you leave for people to ‘puzzle out’ while maintaining a system that feels visually intuitive? Taraneh Karimi: To make sure the dynamic and feel of the game fits our vision, we wanted the levels to be pure 2D concept art. 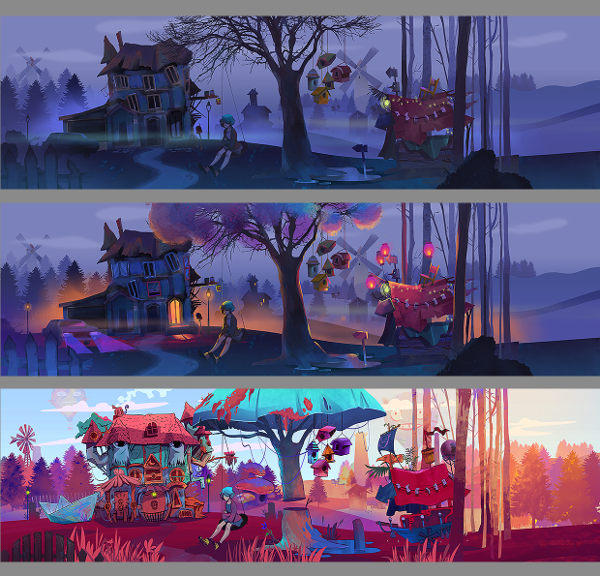 We always see concept art from games, which we love, and in Lona, we wanted to have the exact same aesthetics as in-game experiences. 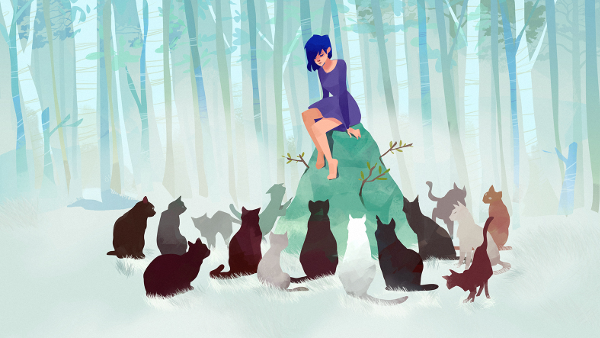 To achieve this, our main challenge was assembling all the layers and objects in a perfect way, without forgetting that many of them are animated and we have up to three versions of each at the same time: Cat mode, Crow mode and Balance mode. We spent time on R&D in Unity and finally came up with a proper pipeline that is both feasible for the designer and the artist. As there’s no HUD, inventory, or dialogue, the player just faces visuals and music, along with some subtle hints in animations or musical notes to help the player find the interactive items to solve puzzles with. Both visuals and music change gradually as the player progresses through the level, leading to the perfect balance therein. EM: As you’re leaving out a traditional HUD and giving players a point-and-click experience, let’s speak to adventure games as a genre; there’s been a recent resurgence of indie games that interact via beautiful landscapes (as opposed to first-person shooters, real-time strategy games, etc). What do you see as the most essential mechanics in a game like yours, and as every game has a learning curve, what design elements help get gamers into the driver’s seat as quickly as possible? TK: At first, the player starts with very basic interactions, including some obvious ones. For instance, a moving bag, and when you click on it, the cat jumps out and hints toward the next item. As the game progresses, each item leads to a more challenging puzzle (like the pipe puzzle in Neverhood) fitting with the learning curve. We also have a “magic” mechanic; sometimes you can drag an object (without having any inventory) and put in on an special object to achieve a special effect on the environment. This, added with simple point-and-click mechanics, are our minimal design to get the best out of the “art” experience we’re aiming to deliver. EM: The game uses Mr. Ruppel and Ms. Schmidt to represent real versus surreal, logic versus chaos, presenting dual viewpoints as a way to experience Lona’s struggles. This question may seem simple, but why two and not three or four oppositional forces? TK: First, our design represents the Crow as “Yin” and the Cat as “Yang”. So based on a Yin-Yang approach, we needed the forces of black and white. Other than that, each mode of each level is going to have a different art style, and with our core mechanic (world-swap) we are swapping between two different and new art styles in each level. That switch works the best in a two-sided world (with our intention for minimal input from player), going back and forth to solve the puzzles. EM: Your Kickstarter is picking up steam, so what was the preparation process like, going into the crowdfunding effort? What kinds of responses have supporters given, and how do you see the current state of game funding changing? TK: We knew from the beginning that we were going to put this game on Kickstarter, and on PC as a start. The rationale being that with an art game like this, it is very risky to spend a couple of years on production before seeing whether people like it or not. We wanted to make sure people get the idea and like it, and after almost 48 hours of our Kickstarter campaign, we are getting some very positive feedback! Our main focus was good aesthetics, and we are so happy that we delivered. If the campaign is successful, we will be fed with a fuel to make the best out of this beautiful and risky(!) idea. EM: You mention Hayao Miyazaki as an influence, and I also see some of Alice in Wonderland (the animated version from the ’50s) in your work. Can you speak to your art style, the use of vibrant colors and contrasts, the philosophy behind what makes things ‘magical’? TK: I designed Lona’s character based on myself, an artist who uses art as her mode of expression. For the visual development of Lona, I can only speak to the girls of Miazaki’s masterpieces, as each one comes with a deep character and a philosophy behind it, rather than being just another beautiful princess. Also, the vast environments of Miyazaki’s universes and a general birds-eye point of view enrich the story, and I used them for inspiration for Lona’s landscapes and mise-en-scènes. The colors and my technique mostly come from my various experiences in graphic design and digital painting. EM: Describe the SpaceFox team and the creative flow within your respective spheres. With sound, visual, and story elements contributing to the overall feel of the game, how do you organize time and resources within the studio, creating the best possible outcomes? How do hard decisions get made, if people disagree about content? TK: Good thing about SpaceFox is that it’s a small yet very dense team. Me, myself, as the artist will do all the needed visuals, while our designer and programmer are also very good at what they do. It might be SpaceFox’s first game, but it’s not the first video game project we’ve been involved in. All of us have worked on other projects, and we realized now is a good time to team up for this indie adventure. Amir, our creative Director, is also Lona’s producer, and Farshid, our tech supervisor, is in charge of a brutal project management job here! Most of our decisions are made within the team where everybody gets to hear and comment on elements from all the possible point of views. Another reason for putting this game up on Kickstarter is that we wanted to be sure the project has what it needs to succeed, so that everyone can allocate enough time to get it done. EM: The advent of the internet means ideas and communities are able to communicate ideas, art, and interests almost instantaneously. Lona has struggles, but her universe is somewhat contained to the world in which she lives; I live in Fargo, and you live in Tehran, so do you see the vast amounts of interaction around the world resulting in a kind of ‘sameness’ and derivative projects, or are we inspiring one-another to great effect? For Lona, how do you see this balance of external pressures versus inner turmoil? TK: The magic of globalization and the internet is definitely the best thing that could happen for a range of industries, including video games and indie productions. I believe that when it comes to creativity, the sky is the limit. Sure, we do get inspired from each other, but I think it could be a part of a great evolution, and history will pick the best to archive and present as legacy. There are many ways for people to get connected to each other, and all these minds together will lead to a beautiful result of human social activity. EM: Ultimately, the game discusses a conflict of the mind, moving between beautiful interpretations of conflict. In my experience, most games have an ‘ah ha’ moment, a genesis from which the core idea comes. For you, what sparked the project, and what fell into place, allowing it to become the project we see today? 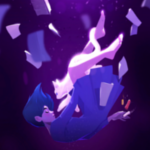 TK: Well, at first I was sure about my choice of interactive storytelling, so I knew that Lona would be best made as a game. Regardless of the genre, I wanted to tell a story that I was personally living with, and I didn’t want to ruin the experience by making Lona walk in the game like classic adventures. I wanted her to be literally “trapped”, so I needed my game designer fellows to come up with ideas, and then Ms. Schmidt and Mr. Ruppel were born. Aside from that, our vision at SpaceFox is to make games that you can play as a pleasant experience (aesthetically speaking) and so I made sure every design/art decision is serving that purpose. We really hope people like what we are cooking and support us, because this is a project from soul, made with love, talent, and passion.